In this post we’re going to discuss migrations in Core Data. This is part three of a tutorial series covering the usage of Core Data in Swift to write iOS apps with persistence. While I think you can benefit strictly from reading this post, it may be easier to follow along if you go back and read Core Data in Swift Tutorial (Part 1) first. At this point in the tutorial, we’ve created a simple app that can create and delete log item’s backed by a Core Data store. We’ve learned about creating, deleting, and modifying Core Data objects. We looked at sorting lists of objects, filtering them out using predicates, and even combined predicates to make compound predicates. With this much information, we can do a ton of stuff with our apps. Why Make Core Data Migrations? 1) Store some data inside of an app using a set schema. For example a Model named LogItem with a title(String) attribute. 2) Change any of the schema. For example add a new full title attribute to become ‘fullTitle’. To demonstrate the default behavior, it’s useful to see what happens if we don’t take care to perform migrations. If you’ve been following along you should have a Core Data model that contains one entity, LogItem with two String attributes, itemText and title, as shown in the figure below. First off, we need to run our app and create some records. If you’ve been following along you can just add a few log items. This is enough to populate the Core Data store, and create a set schema. Next, let’s add our “fullTitle” String attribute. Just click the “Add Attribute” button and punch in fullTitle as the name, and String as the type. This is a rather intimidating error message. There’s so much to read, and so little of it is familiar. I want you to focus on on particular key though, “reason”. When you get a Core Data error, it comes back with a ton of information, and the relevant part is almost always the value of “reason”. In our error, we see a couple of reasons, but we’re most interested in the very first one. If you find you have a conflicted Core Data model, but you don’t want to create a migration yet, you can also just delete the app from your simulator or device. This will create the new schema instead. This is generally my solution when my model is going through a lot of migrations, but you NEVER want to do this with a deployed model version. You’ll just have people on the app store with your app crashing. They aren’t going to know to delete the app and reinstall either, they’ll just delete it and leave you a 1-star review. Error 0xc0000005 in runtime may be annoying and persistent, but it is not totally hopeless, repairs are available. To create a migration, we need to first make some changes to our persistent store. This is the code that Xcode generates for us when we create a project using an Xcode template. By default, Xcode does not include any kind of migration options at all. In the code that Xcode provides there is a lazily computed variable called persistentStoreCoordinator, and it’s responsible for making migrations happens. It looks like this, and we’re most interested in line 8. // The persistent store coordinator for the application. This implementation creates and return a coordinator, having added the store for the application to it. This property is optional since there are legitimate error conditions that could cause the creation of the store to fail. Now, the persistent store coordinator is being added using the addPersistentStoreWithType method. This method looks like it is maybe not updated for Swift, but that’s okay, we just need to pay attention to what’s optional and what’s not. Let’s take a look at the documentation, click here to open in a new window. Opening up these docs you can see some details on what these parameters are. In particular it describes “options”. 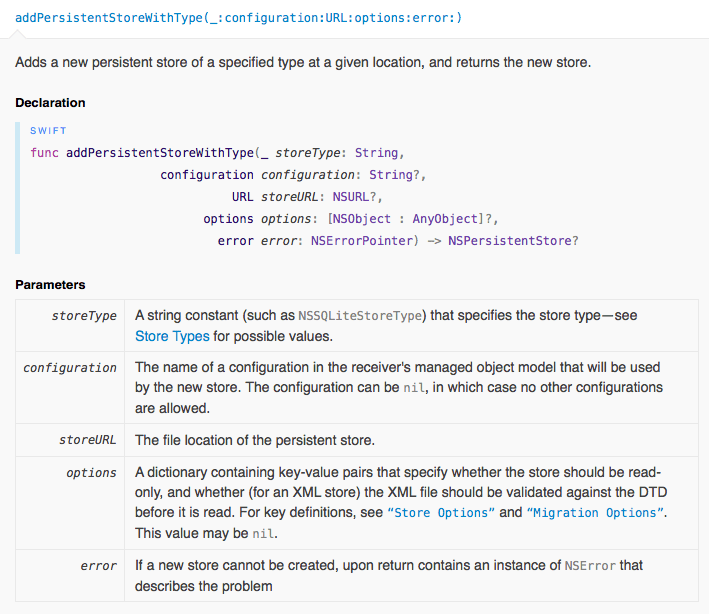 Migration options, specified in the dictionary of options when adding a persistent store using addPersistentStoreWithType:configuration:URL:options:error:. NSMigratePersistentStoresAutomaticallyOption sounds pretty nice. Automatic migration? Sign me up! NSInferMappingModelAutomaticallyOption will create the mapping model, while NSMigratePersistentStoresAutomaticallyOption will perform the migration. So basically what we just did, is we specified we would like Core Data to try and automatically merge and map our models between versions. If you think about what we actually changed in our model, it’s strange that it causes a hard crash. We weren’t using the fullTitle attribute anywhere, it’s just a new field to add really. It could just be automatically added to every model with a null value. Or, if we specified a default value for the attribute, it could just apply that to all existing records. That would be much better than crashing, but Xcode doesn’t want to just make the assumption that we want to do that. So this is how we specify we want Xcode to try anyway. Now, let’s actually add the new attribute. Before, we just opened up our model and added it as a new String attribute, but that’s not going to create a migration model. We need two versions of the model so that Core Data can understand the differences in the two models. 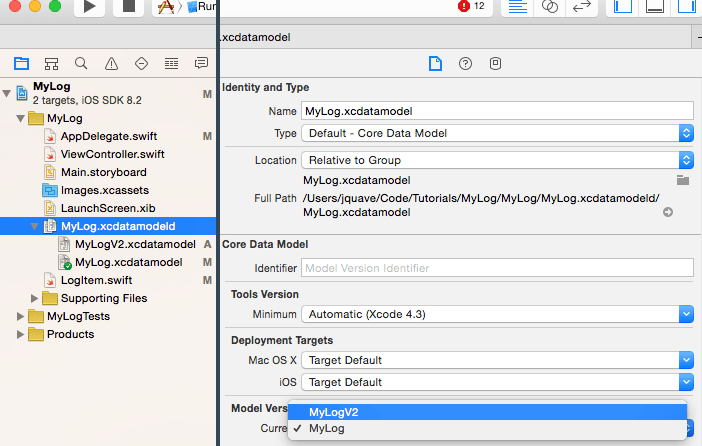 In the Project Navigator, select your Core Data model, for example MyLog.xcdatamodeld. Now in your menu bar, select Editor > Add Model Version.. as shown in the figure below. You can call it whatever you want, I’ll be calling it MyLogV2, and press Finish. You’ll now find you can expand your xcdatamodel file to see multiple versions. Select your second version as shown in the figure below. Now, in our version 2 of the model, let’s add our fullTitle(String) attribute. 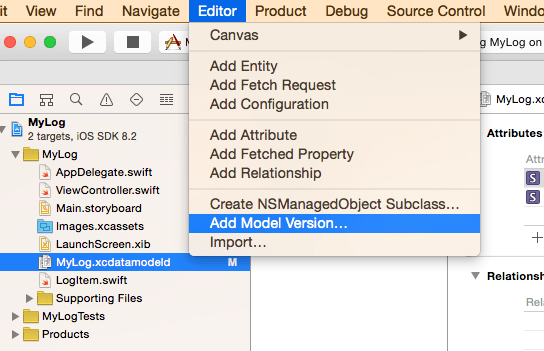 We’ll also want to update LogItem.swift, the NSManagedObject subclass we created to represent this model. Finally, we need to actually make version 2 of our model active. Click on the MyLog.xcdatamodeld parent object in the Project Navigator. Then open the Utilities panel on the right-hand side of Xcode, and select the first tab, the File Inspector. Here under “Model Version” there is a dropdown where you can select the new version 2 of the model, as shown in the figure below. Now, if you’ve been following along, there are some errors you’ll need to fix where we are initializing the LogItem objects without specifying the fullTitle. We added the attribute to the initializer, so now we need to go one by one and specify the fullTitle in each of these cases. In particular we need to add these in viewDidLoad where we create some starter objects. In earlier tutorials, we also created a saveNewItem function that uses the initializer inside of ViewController.swift. So we need to specify a full title for that as well. 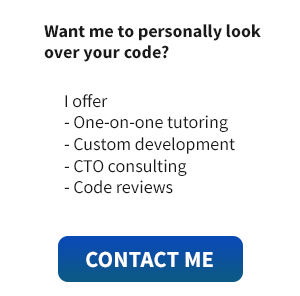 For now, we’ll just use a static string “My Full Title” as the fullTitle value. Now, for the moment of truth… run the app. If you get an error here, let us know on the forums. I know this is a difficult topic, and I know the tutorial is never going to be easy to follow. But, I know if you’ve come this far you can and will succeed in learning this material. We just need to make sure you don’t get stuck. Otherwise, congratulations, you’ve created your first auto-migration! This is known as a light-weight migration. There is more to migrations than this, as you can specify custom mappings, and there are caveats once you have more than 2 versions of a model. But knowing what we discussed in this tutorial is good enough to get your app to v2.0, and published. Full source code for this tutorial here: Core Data In Swift Tutorial Code. Liked this tutorial? It is a modified version of a draft chapter in my Swift Book. P.S. Wanna write for this site? I need help writing quality content. Learn More Here.